I was at the farmer’s market recently and with the winter veg dwindling, I grabbed a bunch of kale and thought I would experiment with a green that I don’t normally cook with. Kale is one of the veggies that I want to add to my “I need more of this in my life” list. It has cancer-fighting properties is great for detoxing the body — just what I need after a late Saturday night. Everything else I just grabbed out my cupboard and fridge and threw together a lovely nutty and bright dish that is great on a cold winter’s night or as a cold salad on a warm day. Pour farro into medium saucepan and cover with cold water until an inch above the grains. Let soak for 20 minutes. Drain farro and recover with cold water. Add a generous amount of kosher salt and bring to boil. Lower heat to a simmer and cover for 10 minutes. While farro is cooking, wash and dry kale. Cut into bite-sized pieces. Juice half a lemon into a glass measuring cup and add the same amount of olive oil. Add salt and coarsely ground pepper to taste. Set aside. In a small dry pan, toast pine nuts until light brown and remove from heat. 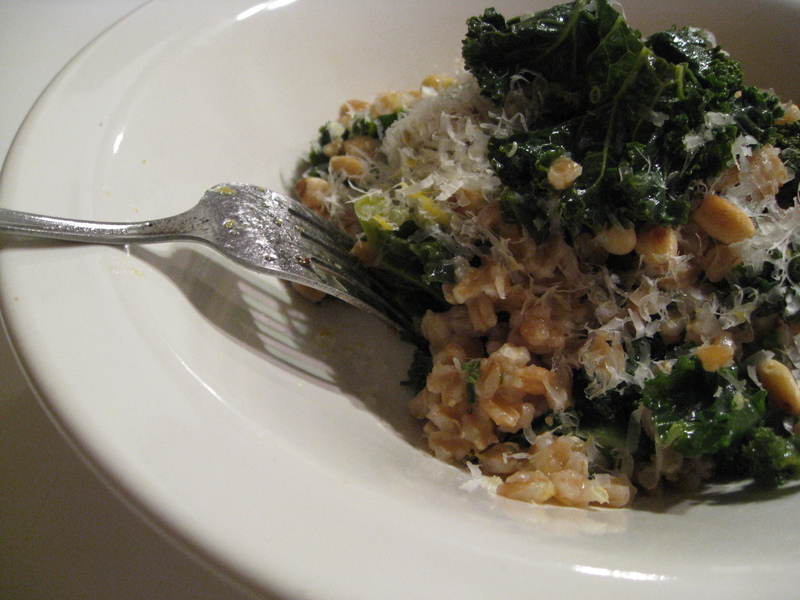 After farro has cooked for 10 minutes, add kale to the pot on top of the farro and recover for an additional 5 minutes. After 5 minutes, turn off heat and check to be sure kale is bright green and tender and farro is cooked, but still has an al dente bite. If more time is needed, cover the pot off the heat for an additional 3-5 minutes. Drain farro and kale and transfer to a large bowl. Pour lemon and olive oil over salad and toss to mix. Serve in a bowl with grated parmesan and toasted pine nuts sprinkled on top. Enjoy! This sounds tasty (and healthy!) We’re going to have to try this soon.